Harold "Harry" Wilson enlisted in 1941 and in November 1942 training at 42 air school Port Elizabeth South Africa and qualified as a bomb aimer 12/02/1943. 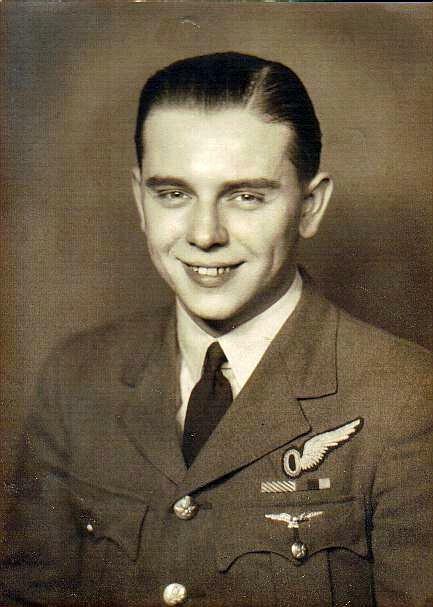 Initially with 9 squadron he transferred to 97 squadron in January 1944 remaining mostly with same crew throughout, Bob Lasham being the pilot, and who all survived the war. He completed 2 tours and remained in service until 1953 or thereabouts. Harry received the DFM in November 1944. Lasham's crew moved from 9 squadron to 97 squadron in Feb 1944. 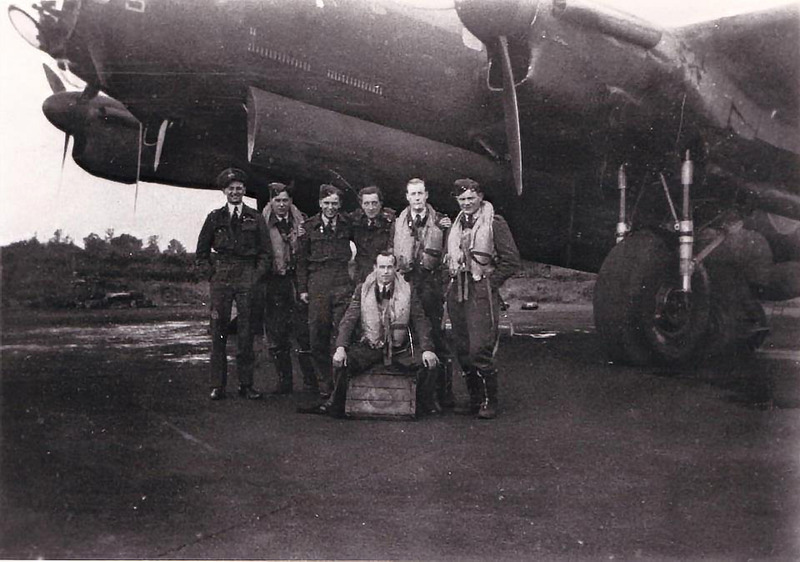 Although some of the crew were not keen, Bob persuaded those unsure that if they stayed together as a complete experienced crew they had better chance of survival and that as the Pathfinder tour was only 15 missions and not 30 as previously. Bob himself completed 50 as he refused to leave until the rest of the crew completed 45. Bob Lasham is the only surviving member to this day. Flight Sergeant Wilson has completed 37 sorties of which 19 have been with the Pathfinder Force and 16 as a marker. His targets have included many heavily defended places deep in the heart of Germany including Berlin (6 times), Stuttgart (4 times), Schweinfurt, Stettin, Leipzig and others. His courage and determination to press home his attacks are well illustrated on 18th July, 1944. On this occasion, Flight Sergeant Wilson was flying as visual Air Bomber in an aircraft detailed to attack Bordeaux. Whilst in the target area, the aircraft was damaged by heavy anti-aircraft fire. The Perspex of the Bombardier’s cabin was shattered, one of the engines caught fire and one of the crew members was seriously injured. Undeterred, through hampered by a stream of cold air coming through the shattered Perspex of the Bomb Aimer’s cabin, Flight Sergeant Wilson carried out an accurate bombing run and was successful in putting the bombs on the aiming point. Flight Sergeant Wilson was of invaluable aid in rendering first aid and assisting the Navigator to bring back the crippled aircraft back to an aerodrome in Southern England where a successful landing was made. He is a keen Air Bomber and a most capable set operator. For his fine example and keen devotion to duty, he is recommended for the award of the D.F.M. 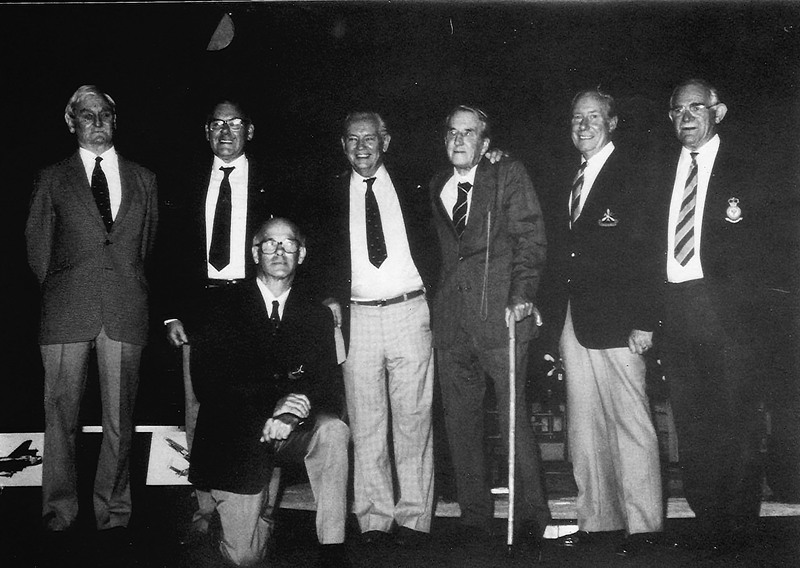 a poem penned many years later at the reunionmentions the seven of them as in the photo as Gerry, Bob, Nick, Joe, Harry, Reg and Bill.